with the new psychological horror film, Split. Quick sidebar: I honestly feel that M. Night Shyamalan has gotten a bad rap over the last 10 years or so. Sure he’s had some stinkers (The Last Airbender, After Earth) – but I actually enjoyed The Happening for the ridiculousness (that’s putting it kindly) that it was and also kinda dug The Visit. They all can’t be The Sixth Sense, Signs, or Unbreakable. I think I’ve named enough of his movies for now. But anyway, in my opinion – Split has put him back on top and the box office seems to agree too. So what’s Split about? Hmmmmm – it’s actually probably going to sound more complicated typed out than it actually is. We have Claire (Haley Lu Richardson), Marcia (Jessica Sula), and Casey (Anya Taylor-Joy) attending an afternoon gathering when all of a sudden – the girls are abducted by a stranger, who seems to have a bit of OCD. That stranger is played by James McAvoy and at this moment he is ‘Dennis’. As a whole though, he is Kevin, a man that has Dissociative Identity Disorder and has multiple personalities that come out at will – some more dangerous and conniving than others (more specifically ‘Dennis’ and ‘Patricia’). Taking center stage out of our kidnapped trio is Casey, a bit of a loner with a troubled past that is told throughout the film via some uncomfortable flashbacks (that Uncle deserves a slow death btw). She seems to have the most sense, using that to her advantage to try and break down Kevin’s alter egos, most specifically ‘Hedwig’ – a simple young 9-year-old boy that might start a new trend of people saying “Etc…” after a sentence. While the other two girls get caught and separated after failed attempts, Casey is more in tune with using manipulation to get to safety. Kevin and his alter egos, of course, have other plans. It isn’t really until we meet Kevin’s psychologist Dr. Fletcher (Betty Buckley) that we start to get a clearer understanding of what he’s been dealing with nearly his whole life. Dr. Fletcher believes that having DID is a reflection of the brain’s enormous potential, instead of something that is a disability. What can your brain unlock if it’s used to that full potential? It may surprise you and surprise those who watch Split and witness Kevin attempting to tap into the ultimate alter ego called: The Beast. Between Kevin bouncing back and forth from his appointments with Dr. Fletcher to his underground bunker where the three girls are being held captive, Split moves along a pretty smooth pace (considering the runtime is nearly 2 hours). There are tense moments, a little comedy relief (thanks in most part to ‘Hedwig’), and an overall great ‘cat and mouse’ game that had me more engrossed in the ‘cat’ than the ‘mouse’. At the end of the day, this is James McAvoy’s movie. Much of what happens onscreen is dependent on how he pulls off portraying each personae. Even when he is at his most diabolical and evil as ‘Patricia’ or ‘Dennis’, you still sympathize with him in the end as Kevin. Given that Split is out very early in the year, it might hinder his chances at any awards buzz when 2017 comes to a close. Hoping that’s not the case, as it’s one of the better overall performances I’ve seen in a long time and it’s quite fun to marvel at his craft. 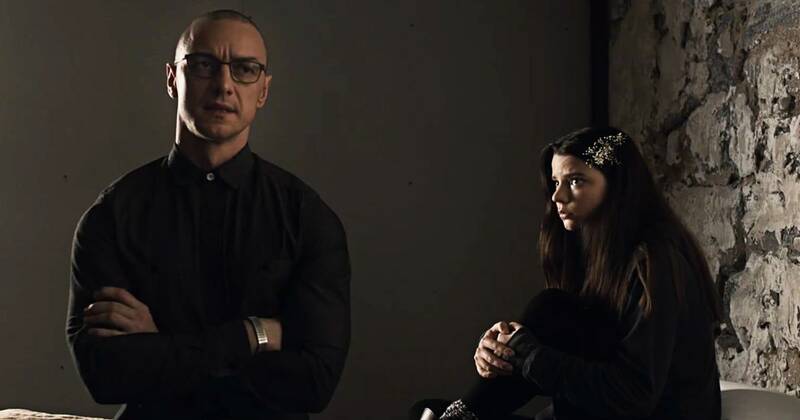 While McAvoy is clearly the star here, Anya Taylor-Joy is no second banana as the protagonist in Split. I just realized there’s somewhat of a banana split joke there! Anyway, she shined in The Witch last year, and her performance here as Casey will only make her stock rise in the aftermath. Overall, the acting by all involved was top notch. And then we have M. Night Shyamalan. This is where most of the spoilers occur btw, so stop reading if you want your day spoiler-free. I know that The Sixth Sense is his film most talked about, but for my money, it’s Unbreakable for the win. I noticed similarities between that movie and Split as I watched…….so it really came as no surprise when it was confirmed that the two were related. Yes, there are scenes in Split that support this, but I also read that Shyamalan had written the character of Kevin for Unbreakable, but scrapped it due to complications trying to fit everything into that script. He always intended for Unbreakable to be a trilogy – and suffice to say that the trilogy has a good chance of happening after all. Split kind of reminded me of how I felt after seeing 10 Cloverfield Lane last year. I went in with super low expectations, but came out singing it’s praises. Not actually singing, because that would be terrible – but you get the gist. Even though Split moved along relatively smoothly, I feel it still could have been trimmed a little in the runtime area. There were some scenes that felt to begin to drag it down a little, but thankfully it knew when to bounce back on cue. I was also a bit bummed that there wasn’t an actual Kanye West song used for ‘Hedwig’s’ dance sequence btw! Meh. That’s a small potato gripe though. 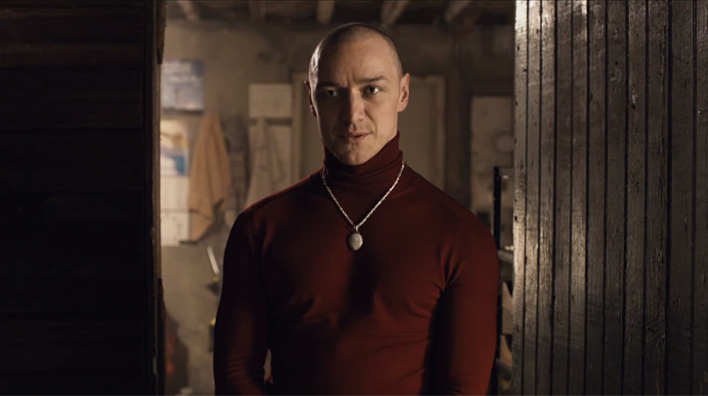 I’m not an M. Night Shyamalan movie expert, but in my honest opinion, Split will be the springboard to him regaining some of the respect and admiration he may have lost over the last 10 years. It’s unique, tense, peculiarly charming at times, and an acting tour de force for James McAvoy. Go witness it on the big screen and then go eat a banana split afterwards just for irony. This entry was posted in Review and tagged Anya Taylor-Joy, Anya Taylor-Joy Split, Anya Taylor-Joy The Witch, best movies 2017, dirty horror, Haley Lu Richardson, Haley Lu Richardson Split, Hedwig Split, James McAvoy, James McAvoy award Split, James McAvoy Split, Jessica Sula, Jessica Sula Split, M. Night Shyamalan, M. Night Shyamalan best movies, M. Night Shyamalan movies, M. Night Shyamalan Split, M. Night Shyamalan Unbreakable, review, split, split movie review, split review, The Beast Split by Dirty Horror. Bookmark the permalink.